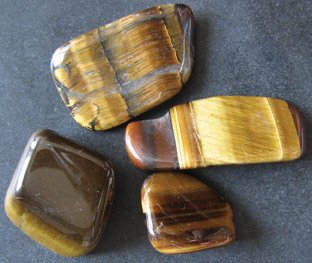 So far we have seen that the spiritual interpretation assigns Tiger’s Eye to Gemini, Rose Quartz to Taurus, and Carnelian to Aries as their birthstones. Now we will discuss the most important treats of Sagittarius and the meanings of Chalcedony as spiritual birthstone of this Zodiac sign. Between 22nd of November and 21st of December, our planet Earth is submerged into strong outpourings of the Light Temple of Fire and Inspiration. These energies are best received by people born in the Zodiac Sign of Sagittarius. In this, they can get significant help from the world of crystals and stones. Many crystals, but particularly Sagittarius birthstones, are able to accumulate and permanently irradiate the energies of this temple. If we consciously try to make a bridge between our inner and outer life, if we try to be objective about our subjective reality, then we are engaged in spiritual practice. The Spiritual science teaches us that we are a soul with a body, and not the other way around. The more we identify in this way, the more we achieve love, power, strength and ability to enter into union with our Higher Self. All higher spiritual principles are contacted in the zodiac sign of Sagittarius. Latter on, these principles are being transformed into earthly laws, in the sign of Capricorn. The key features of Sagittarius are duality, ambition, focused attitude, intuition, idealism and right orientation. The link between the human soul and the animal body is symbolized with the Centaur – a creature half-man half-horse. The centaur represents this sign – it is a symbol of the awareness identified with the outer form and trapped inside the material body. Our lower nature, after many cycles of birth and rebirth, becomes purified and controlled by the intelligent consciousness of the soul. 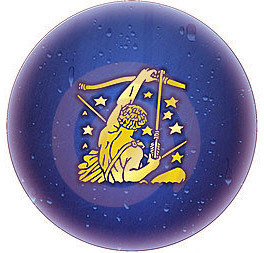 Sagittarius on the spiritual path learns how to aim their arrows of directed thoughts and aspirations toward the sky. If their thoughts have enough quality and strength, the spiritual response from above comes in form of light and enlightenment. This response is the basis of the science of Invocation. The keyword of this sign is – “I see the goal, I will attain the goal”. Sagittarius becomes aware that their earthly desires eventually will be transformed into Divine love. These energies can enable Sagittarius to to develop their mind and intuitive perception and to integrate the personality with the soul into a harmonious unity. This is the process of forming a bridge in awareness, a path between the soul and personality,”a bridge to freedom”. Love and harmony, although here achieved through conflict, in the final result, however, connect the dual nature of a human being into a single whole. Idealism and aspirations of Sagittarius are at the same time, their great talent and their Achilles heel. Passions and emotions are features ruled by Mars. Owing to that, Sagittarius can be very earthy and sensual, controlled by passions. Their balance is reestablished with tolerance, patience, sense of responsibility, ethics, moderation and discipline. Sagittarius possesses expansive character due to Jupiter, which is their ruler. This can be expressed as a slight exaggeration to make a point, or rough exaggeration that is pure story telling without truth. The word illusion is most opposed to the word intuition. This pair of opposites, best reflects the problem of Sagittarius. The illusory world of ideas, painted by the idealistic tones of Sagittarius, obscures their thinking. Sagittarius is good at viewing the wide blue horizon of the great cosmic picture, but they are not always able to sufficiently distinguish and filter their impressions. The time of year when Sagittarius rules is perfect for focusing on discipline and control of our lower nature. Chalcedony is a colorful crystal of quiet beauty and power. It has a silky shine and can be more or less translucent. 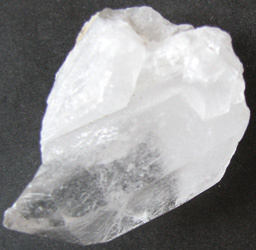 This crystal brings peace, security and happiness, at the same time removing fear, depression, mental disturbances and sadness. Chalcedony allows anyone who wears it to be more open towards the inside sphere of life. At the same time, objectivity and constructive view of the world is maintained. This stone increases mental stability and inner peace, while its energy soothes and stabilizes. Chalcedony enables our thoughts become more visible. It brings our body, emotions and mind in harmony with the spirit. Chalcedony promotes emotional honesty and balance, vitality, stamina and increased life energy. In the past, it has been used to release the illusion and fantasy, and usually it has been carried around the neck. It is believed to prevent psychic attacks and protects against black magic. This Sagittarius birthstone prevents accidents. During the Renaissance, chalcedony with engraved picture of a person with a raised right hand was used to obtain judicial resolution. 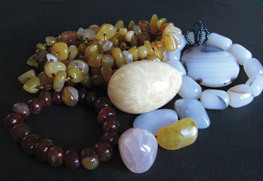 In Italy, mothers wore white chalcedony beads to improve their breastfeeding, for good luck, or to prevent accidents. Chalcedony possesses additional powers, depending on the color. Blue Chalcedony is a crystal of gentle energy; it balances the mind, body and spirit. It brings joy and faith. It soothes, enables better communication, and successful public appearances. This personal birthstone of Sagittarius reduces negativity, increases clairvoyance, awakens intuition and healing. Yellow and brown chalcedony promote clarity and discernment and support all forms of life. Pink Chalcedony deepens the already acquired positive personal treats, brings inspiration and willingness to learn. It helps a Sagittarius person to achieve their ambitions, by providing clearer mental processes and limiting the dangerous and whimsical desires. White or gray Chalcedony acts with soothing power to the psyche, rehabilitating from nightmares. It can be worn in form of a bracelet or pendant and during the night it can be placed under the pillow. In addition to chalcedony, for those of you born in the sign of Sagittarius, the following birthstones can be significant: tiger’s eye, topaz, sodalite, sugilite and amethyst. Remember that when choosing a crystal or birthstone for personal use, it is important to follow your own intuition above all other things.